With all of the gorgeous sentiment Die-namics we have to offer — many in delicate fonts — it's fun to come up with ways to feature these bold messages. This week, let's take a look at how Stephanie creates depth and sturdiness with a Dimensional Sentiment. Watch the video below or click here (MFT September Release Class - Dimensional Sentiment) to watch it on YouTube. Don't forget to subscribe to our YouTube channel so that you don't miss a single tutorial! This is just one of five classes available for our September Release Classes. You can see the other four videos HERE. Let's take a look at more examples of creating dimensional sentiments on your projects! Laurie not only stacks the word grateful from our Grateful for You stamp set, she also created a beautiful ombre effect. You can watch a video outlining how she did it HERE. 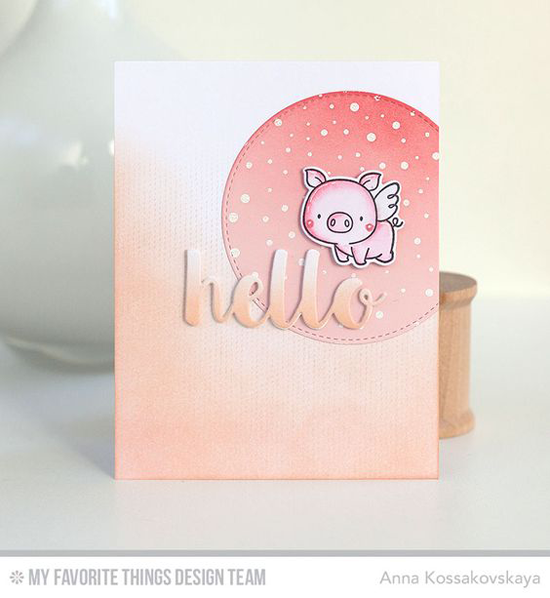 Anna's pink and peachy design is totally delightful, and the heft of the hello gives the card just the right amount of balance. Barbara's bold friend in black stands out agains the lovely flowers from the Bold Blooms stamp set. Placing the sentiment in the lower third of the design creates perfect balance, and the white space draws the eye to her pretty design. Feeling inspired? Grab a your favorite word Die-namics and stack them up for some extra dimension on your next project. So cute and sweet cards !